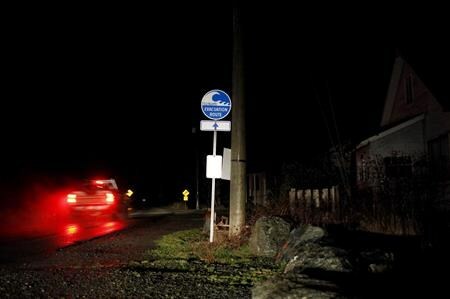 VICTORIA — When tsunami-alert sirens rang out in the dead of night in Port Alberni 14 months ago, most people fled for higher ground but some didn’t recognize the emergency signal, says a new study. A magnitude 7.9 earthquake off the coast of Alaska Jan. 23, 2018, at 1:31 a.m. prompted a tsunami alert along much of Canada’s West Coast, including Port Alberni on Vancouver Island. Port Alberni, population of about 17,500, was hit by Canada’s largest tsunami in March 1964 after a 9.2 earthquake off the Alaska coast. The January 2018 tsunami alert was lifted at 4:30 a.m. but not before thousands of people left their homes in various states of fear and confusion, say researchers from the University of British Columbia’s school of community and regional planning in a report released Thursday. She said the threat of a tsunami in Port Alberni is something that’s never far from the minds of those in the community. About 200 soldiers were poised to start filling sandbags and carrying out evacuations in the Outaouais and Mauricie regions Saturday night, with 400 more troops set to deploy there as well as Laval on Sunday, said Brig.-Gen. Jennie Carignan. Quebec’s public safety minister urged residents throughout the day to stay safe and cooperate with authorities. “Be careful, be vigilant…please,” Genevieve Guilbault said alongside Carignan at Canadian Forces Base Longue-Pointe in Montreal Saturday evening. As of Saturday night, turgid rivers had resulted in 903 flooded residences, 251 isolated residences and 317 evacuees across the province, according to Urgence Quebec. Eight major floods were identified by Urgence Quebec on Saturday evening, threatening thousands of Quebecers: the Chaudiere River at Saint-Georges, Saint-Joseph, Scott and Vallee-Jonction, all in the Beauce region; Lake of Two Mountains at Rigaud and Quesnel Bay; and the Beaurivage River in Levis in the Chaudiere-Appalaches region. Guilbault also offered her condolences to the family of Louise Seguin Lortie, who died early Saturday morning after driving her car into a massive sinkhole caused by flooding in the Outaouais region, according to police. The accident left the 72-year-old’s sedan upside down in a swollen stream after rising river levels swept away part of the road overnight, police said. Sgt. 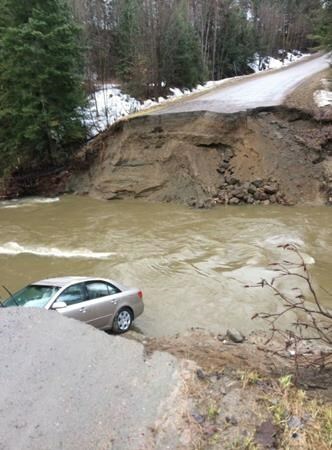 Martin Fournel of the MRC des Collines police said a pair of witnesses parked near the washout tried unsuccessfully to warn the driver as she approached. The woman was taken to hospital but died shortly after, he said. The accident occurred at about 3:30 a.m. in the Municipality of Pontiac, about 30 kilometres northwest of Ottawa. Pontiac, which sits along the Ottawa River, is one of at least four municipalities in the Outaouais region to declare states of emergency, along with Gatineau, Saint-Andre-Avellin and Val-des-Monts. Trois-Rivieres is also under a state of emergency. Rigaud, west of the Island of Montreal, saw at least 68 evacuations, as residents feared a repeat of 2017, when record flooding forced thousands from their homes. William Bradley, whose house in Rigaud sits on a street that hugs the Ottawa River, said he filled several hundred city-supplied sandbags this week. He’s stacked them four-high around doors and windows, wrapping the makeshift barriers in polyethylene. “It’s still coming up, coming up,” said Bradley, 72. He said flooding two years ago caused about $100,000 in damage to the ceramics equipment he stores at home for his small business. More than 45 millimetres of rain fell on the Montreal area between Thursday and Saturday, according to Environment Canada. Rainfall warnings have been lifted, but water levels were already high and are expected to rise sharply over the weekend with warm temperatures and snowmelt runoff. The City of Laval, just north of Montreal, said in a statement it had distributed sandbags to 900 homes and knocked on 550 doors to make sure people were safe as more than 1,500 homes and business remained under flood watch. Quebec City and the Gaspe Peninsula can expect up to 30 millimetres of rainfall this weekend, said Environment Canada meteorologist Andre Cantin. “That will help the snow to melt again, and we do not expect the river will be able to go down for at least 48 hours,” he said Saturday. Guilbault has said the province will allow stores — usually closed on Easter Sunday — to remain open this weekend so residents can stock up on supplies. Some of the worst flooding Saturday appeared to surge through the Beauce region south of Quebec City, where 868 homes were flooded and 94 people evacuated as of 3 p.m., according to an Urgence Quebec bulletin. In Beauceville, about 90 kilometres south of Quebec City, officials have asked the Canadian Armed Forces for assistance with evacuations ordered by the municipality. Earlier this week, the Chaudiere River burst its banks and flooded a large part of downtown. Officials called it the worst flooding since 1971, with 230 homes and businesses flooded. 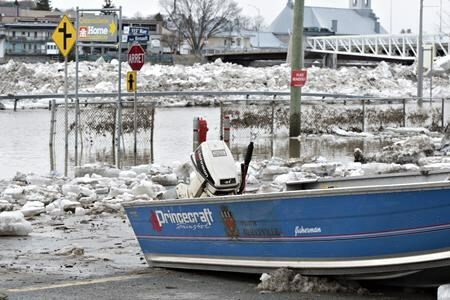 In Saint-Raymond, about 60 kilometres northwest of the provincial capital, 24 seniors in three residences have been moved to higher ground as the Ste-Anne River continues to rise. A local dam gave way Saturday, said Mayor Daniel Dion, prompting concerns about flooding. “The problem today is that there is a lot of ice. If they clog our channels the water will have no space to circulate and that’s where it overflows,” he said. In the Mauricie region, Canadian Armed Forces are focusing on Trois-Rivieres as well as the municipalities of Becancour, Louiseville, Maskinonge and Yamachiche. MONTREAL — Quebec’s deputy premier and public safety minister is urging those affected by flooding to exercise extreme caution and vigilance as rising water levels continue to wreak havoc on the province. “Do not take unnecessary risks, please,” Genevieve Guilbault said at the Ti-Oui Snack Bar in Saint-Raymond on Saturday. Regional liaison officers for the Canadian Armed Forces are deployed in five districts and prepared to assist residents, she said: Outaouais; Montreal, Laurentians and Lanaudiere; Monteregie and Estrie; Quebec City; and Chaudiere-Appallaches. Tragedy struck early Saturday morning when a woman in her 70s died after driving her car into a massive sinkhole caused by flooding in western Quebec, police said. The accident left the woman’s sedan upside down in a swollen stream after rising river levels swept away part of the road in the Outaouais region overnight. Pontiac, which sits along the Ottawa River, is one of at least three municipalities in the Outaouais region to declare states of emergency, along with Saint-Andre-Avellin and Val-des-Monts. The city of Trois-Rivieres is also under a state of emergency. In Beauceville, about 90 kilometres south of Quebec City, officials have asked the Canadian Armed Forces for assistance, with military vehicles en route to help with evacuations ordered by the municipality. A local dam gave way Saturday, said Mayor Daniel Dion, prompting concerns about flooding. “The problem today is that there is a lot of ice. If they clog our channels the water will have no space to circulate and that’s where it overflows,” he said. Dion said he expects the high-water mark to come Sunday evening. Four major floods have already been identified by Urgence Quebec: the Chaudiere River in Saint-Georges; Saint-Joseph and Vallee-Jonction in Beauce; and Deux-Montagnes Lake in Rigaud. As of noon Saturday, there were 72 flooded residences, 53 isolated residences and 197 evacuees across the province, according to the most recent Urgence Quebec bulletin. The most affected areas are Beauce — south of Quebec City — and Rigaud, west of the Island of Montreal. Provincial police are checking up on residents door to door in Beauceville and Rigaud, where the Surete du Quebec (SQ) have set up command posts, said Sgt. Marie-Michele Moore. About 40 millimetres of rain have fallen on the Montreal area since Thursday, with five to 10 millimetres more expected Saturday, according to Environment Canada. Rainfall warnings have been lifted, but water levels were already high and were expected to rise sharply with warm temperatures and snowmelt runoff. Guilbault has said the province will also allow stores — usually closed on Easter Sunday — to remain open this weekend so residents can stock up on supplies. “We’re putting in all our energy, but in the end Mother Nature decides,” Plante said. In a statement, the City of Laval said it had distributed sandbags to 900 homes and knocked on 550 doors to make sure people were safe, as concern rises along with water levels in the Thousand Islands and Prairies rivers. “That will help the snow to melt again, and we do not expect the river will be able to go down for at least 48 hours,” he said Saturday morning.